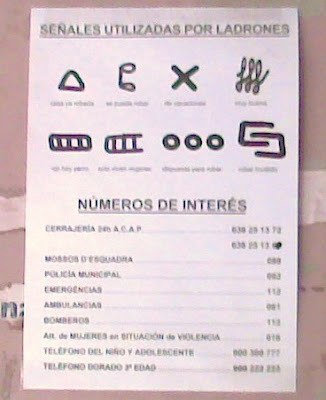 Below is a warning posted in a friend's apartment building entrance that explains the following symbols should they appear by the door. It's a bit blurry, I know. Camera phone. Now, if I recall correctly - the triangle means the house has been robbed, don't remember the next, the X signifies on vacation, the squiggles "muy buena," the complete ladder means there's a dog, and the semi-complete one that there are only women, while the three circles signify that they're willing to be robbed, and the interconnecting cees points to a disabled tenant. Classic. And seven out of eight five hours later ain't bad for the ol' short term memory either.